The holidays are almost upon us. Traditional Christmas decorations are warm and inviting, but those felt stockings, candy canes and wooden reindeer might not be a good fit for your home if you’re a fan of modern design. Modernists, rejoice! We’ve put together some uniquely modern Christmas decorating ideas for a contemporary home. We’ve skipped the cliches in favor of what’s new, trending or simply irresistibly cool. Ready to be inspired? Black and white is a crisp, graphic combination. Why not transform the color combo for Christmas? Santa will be perfectly accentuated in his red suit coming down the chimney into a black-and-white Christmas wonderland. Feathers are like the first snow of winter: pure and fluffy. Add a modern twist to your Christmas decorating by using whimsical birds or owls, or feather ornaments, topiaries or wreaths. If you already have a collection of feathers, use them to fill clear glass balls for a unique display. Living succulents are earth-friendly, low maintenance and an excellent modern Christmas decorating idea. Arrange a few in a centerpiece, or go big with a succulent wreath or garland; however you use these hardy, low-water plants, you can enjoy them long after Christmas is over. Another bonus is their versatility. Add elements such as small objects or oversized ribbon to change a wreath’s look. The fine quality of pine needles create a fresh, modern look. Keep your pine display minimal by using small ornaments and lights to accentuate the beauty of the pine’s texture. Use silver pine in your Christmas decorating; it’s an especially contemporary-looking pine species, known for its beautiful silvery-sage color. Lights have always been the go-to decor for Christmas trees. But the latest LED string lights and fixtures illuminate rooms and objects in new ways. Go big with your light show; the more you use, the cooler the effect. Today’s stylized snowflake decorations add a modern look to any room. For maximum impact, hang them in varying heights and sizes to replicate falling snow. A little Christmas spirit can really elevate a dinner table. Use some of these ideas for your next holiday meal to surprise and delight your guests. Pick a color theme, borrow some Christmas ornaments from your tree and create a modern, festive tablescape. For more ideas on how to create a table setting, see Fresh, Modern Table Setting Ideas to Wow Your Guests. We hope our modern Christmas decorating ideas have inspired you. 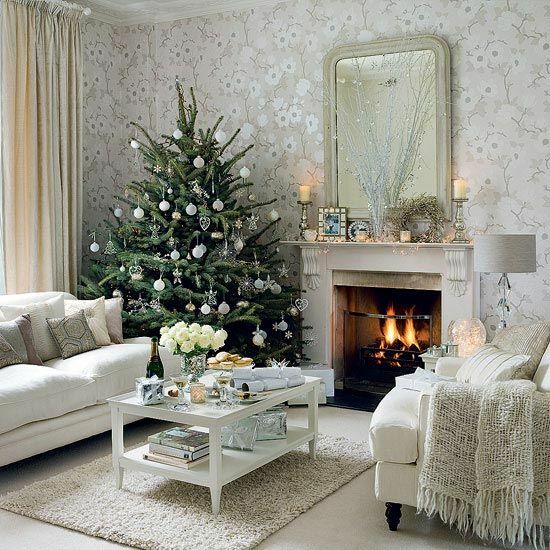 How will you make your contemporary home more festive this season?